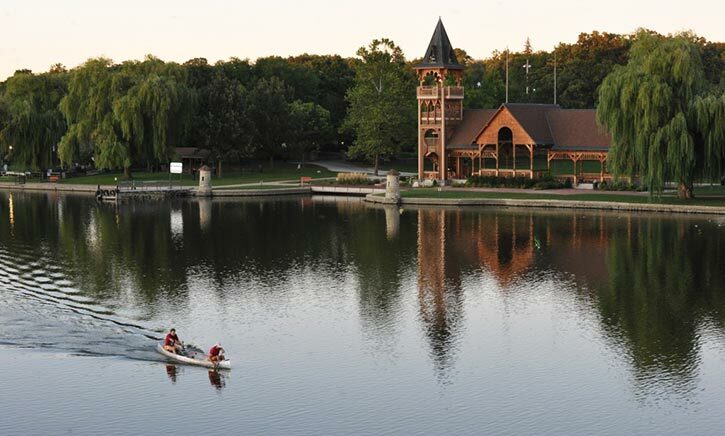 Following the vision of the River Corridor Foundation Master Plan, the St. Charles Park District planned, funded, and constructed shoreline stabilization and other improvements in the three parks which lie on the banks of the Fox River in downtown St. Charles. The River Corridor Foundation provided volunteers to help these efforts. Pottawatomie Park, in downtown St. Charles along the east edge of the Fox River, is a crown jewel for the city of St. Charles. As covered in the master plans for the River Corridor and Pottawatomie Park, a number of improvements to the eastern Fox River shoreline around the park were made. The park was connected to the central downtown riverfront area by a bicycle/pedestrian path that was built underneath the rail and bicycle bridge. Stairs were also built to connect the path to the bridge and a Fox sculpture was added. The improvements to the shoreline add a finishing touch and help to make it one of the most picturesque places along the Fox River. Stopping erosion and the resulting reduction of silt deposits with the new shoreline improve the water quality and make access along the river safer. Mount St. Mary Park, in downtown St. Charles along the west edge of the Fox River, is another gem. In addition to being a recreational destination, it acts as an arboretum and a cultural spot with the annual Sculpture in the Park. Stabilizing the shoreline with native plants reduces erosion and improves the water quality by reducing silt and acting as a natural filter system for the river. The addition of a shoreline deck improves the view from the park and the Fox River while providing access to enjoy the natural beauty. Boy Scout Island has a public boat launch, picnic facilities, and is a favorite fishing location. Unfortunately, it is also prone to flooding and the shoreline was being badly eroded away. The erosion also degraded the Fox River water quality because it added a lot of silt and debris to the water. To preserve the shoreline and stop erosion, large stones called riprap were added. Boy Scout Island shoreline before improvements & stabilization. 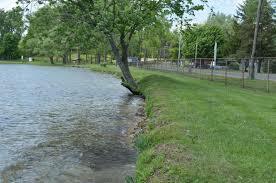 Even during the severe flooding experienced in 2013, the shoreline has remained stable.